Christopher Joseph Ford was born January 11, 1949 in Atlantic City. Quick and agile despite his 6–5 frame, Chris was a ball-handling forward at Holy Spirit High School in Absecon. Highly regarded by Delaware Valley recruiters, he accepted a basketball scholarship from Villanova in 1968. Chris played for coach Jack Kraft at Villanova. Under Kraft, the Wildcats made the NIT or NCAA Tournament virtually every year. As a sophomore in his first varsity season, Chris was a member of a team that reached the finals of the East Regional. The Wildcats lost to St. Bonaventure. Toward the end of the game, in a scramble for a loose ball, Chris landed on Bonnies’ superstar Bob Lanier. Lanier left the game with a knee injury that would take several years to fully heal. Chris was a junior in 1970–71, when the Wildcats went into the NCAA Tournament with only nine players. Nicknamed “The Ironmen,” the Wildcats defeated St. Joseph’s, Fordham and Penn in the East Regional to reach the Final Four. The star of the Wildcats was Howard Porter, a high-scoring forward. Chris played guard alongside Tom Inglesby. Forward Hank Siemiontkowski provided points from the other forward position. Facing superstar Jim McDaniels (who, it was later discovered, had already signed a pro contract), Villanova scored a thrilling 92–89 victory. In the NCAA Final, the great run ended against Sidney Wicks and UCLA. The Bruins beat the Wildcats 68–62. Chris took four shots in the game and missed them all. After graduating from Villanova, Chris was selected in the second round of the NBA draft by the Detroit Pistons—where he was “reunited” with Lanier, and later Porter. Chris was the team’s sixth man as a rookie, and ascended to the starting lineup the following year. During his six seasons in Detroit, Chris was mostly a starter, but also came off the bench at guard and forward. His long-distance shooting created match-up problems for opponents. (In 1979, he would make the first three-pointer in NBA history). Chris did not take many shots, but he tended to make them count. This was the type of player the Boston Celtics were looking for. After more than two decades of success, the team embarked on a rebuilding project in the late 1970s. A week into the 1978–79 season, the Celtics acquired Chris in what was viewed by fans as a minor deal. He would play a major role in their rebirth. The team had already locked up Larry Bird, drafting him the previous spring while he still had a year to play at Indiana State. They would acquire Robert Parish and Kevin McHale in the next two seasons. With veterans Nate Archibald, Cedric Maxwell and Chris’s old Detroit teammate, ML Carr, Boston assembled a powerhouse lineup. In the 1981 playoffs, the Celtics swept the Bulls and erased a 3–1 deficit against the 76ers to advance to the NBA Finals. There they met Moses Malone and the Houston Rockets. The teams split the first four games before Boston took the next two to win the championship. Chris averaged 9.1 points per game in the playoffs. Chris retired after the 1981–82 season. He served as an assistant with the Celtics to Bill Fitch, KC Jones and Jimmy Rodgers before becoming their head coach in 1990– 91. Chris led Boston to the playoffs in four of his five seasons at the helm. 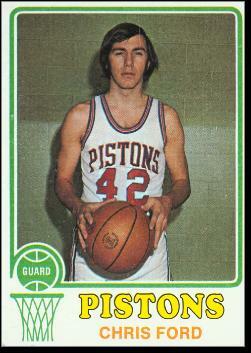 He later coached the Bucks and Clippers, and also the men’s team at Brandeis University. His last coaching job was an interim stint with the 76ers in 2004, where he had served as an assistant to Randy Ayers. Chris did not see eye-to-eye with Allen Iverson during his coaching tenure in Philly, hastening his departure from the bench after the 2003–04 season. Chris was too valuable as a teacher and judge of talent to let go, so the 76ers “kicked him upstairs” where he settled into a scouting job. As of the 2010–11 season, he was Philadelphia’s Pro Personnel Scout, in charge of analyzing talent on other NBA teams.